Wide Asleep in America: Pop Goes the Culture:Live From New York...It's the Same Old Propaganda! Live From New York...It's the Same Old Propaganda! Studio 8H in New York City's Rockefeller Center is not only the two-floor sound stage from which Saturday Night Live airs, but has also long been one of the most important stages for mainstream American political satire and comedic commentary over the past three decades. Whereas during its thirty-four year tenure, from Chevy Chase's prat-falling Gerald Ford to Tina Fey's brilliant impersonation of bimbo huntress Sarah Palin, SNL has successfully lampooned many American politicians, the show has long steered clear of challenging government propaganda or party-line talking points. Dubious ideologies of American imperialism and exceptionalism are not only often ignored but, at times, are even reinforced by the show's writers, producing jokes that can easily be seen as, at best, ignorant and misinformed, and at worst, downright dogmatic and racist. SNL's reinforcement of American political propaganda has never been more pronounced, offensive or unapologetic than under the helm of Seth Meyers, who succeeded Fey as the show's head writer in 2006. Meyers clearly has a hard-on for Barack Obama (he donated $4000 to his campaign) and revitalized the show's waning popularity by exposing the embarrassing absurdity of the Illinois Senator's political opponents. More recently, Meyers has shown that the new President's Congressional adversaries should face defenestration due to their dissent over his economic policies, at the devious bidding of Obama's henchman Rahm Emanuel (a suggestion that I too subscribe to, as long as Rahm is then also thrown through a closed window, followed soon thereafter by the President himself). What is clear is that real issues are never fair game with Meyers in charge, and each politics-related sketch seems to serve the purpose of revealing his own tired political perspective: Republicans are stupid and wrong, Democrats are well-intentioned, if at times silly, but the United States is always right and just. Regardless of this blinkered viewpoint, this format is often harmless and usually humorous. Sometimes, however, the results are a bit more sinister. Even though challenging the American status quo is off-limits to Meyers and his writing staff, they often revel in making fun of foreign countries and cultures, proving time and again that the American public, far from being able to stomach substantial satire and criticism of its own government's policies, historical narratives and national mythologies, eats up racial stereotypes and dehumanizing generalizations like Big Macs, and is always hungry for more. Nowhere is Meyers' own voice heard more explicitly than on SNL's Weekend Update. 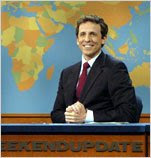 The famous faux-news report segment, an SNL staple since its very first broadcast back in 1975 and obvious inspiration to shows like The Daily Show and The Colbert Report, is arguably the funniest part of each episode and allows the SNL writers to deliver their own perspective and commentary in a much more direct forum, rather than through the prism of sketch comedy or subtle satire. Meyers, as Weekend Update anchorman, is playing himself and, thus, the audience is able to hear his views straight from the source. "The Iranian government this week has demanded an apology from Hollywood saying the films 300 and The Wrestler were insulting to Iranians. Well how 'bout this Iran: you apologize for the hostage crisis, pursuing nuclear weapons, high gas prices, financing Hamas, denying the Holocaust, and setting fire to a Danish Embassy because of a couple cartoons, and then you'll get your apology for The Wrestler." This little laugh-line got the biggest cheer and loudest applause of the evening from the audience and Meyers appeared to be pretty pleased with himself afterwards. But hey, it's an entertainment show that is supposed to make people laugh, right? So what's the big deal? The big deal is that humor doesn't work in a vacuum. Context is what makes situations and punchlines funny, and if a joke is based on a flawed, faulty, or completely false premise, it fails. The joke itself doesn't need to rely on truth, but the context certainly does. The best humor pushes boundaries, challenges assumptions. The only way this particular gag could succeed is if all parties involved - from the writer to the audience - were ignorant of reality and held a strikingly demonized view of the Iranian people. And succeed it did. This characterization (or caricaturization) of Iran is based wholly on American mainstream media propaganda and US - and Israeli - governmental talking points. The premise is that Iran has a lot more to apologize to America for than vice versa and, therefore, the idea of Iran demanding an apology from the US is patently absurd. It assumes that history began thirty years ago and that the United States, the world's Super Empire, has been long victimized, threatened, and offended by a country nearly six times smaller, with less than a quarter the population, and with a military budget that is literally one hundred times smaller than the US'. The United States has been invading foreign nations and overthrowing governments for over one hundred years. In contrast, Iran has neither threatened nor attacked any other country in over two centuries. Meyers' glib delivery played to his audience's own ignorance; his self-congratulatory smirk hid truths that every literate American should really know by now. The crowd hooted and hollered as Meyers claimed that it is Iran that hasn't given the US a fair shake all these years and that this demand on Hollywood just goes one insult too far. Regardless of the fact that the American film industry has long demonized Middle Eastern Muslims, from Beau Geste to Ishtar to Iron Man, as aggressive, violent, irrational, barbaric terrorists hell-bent on destroying the Western way of life for no particular reason, other than perhaps uncontrollable freedom-hating, apparently it's Iran that owes us, not the other way around. In this one punchline, Meyers has revealed himself to be a know-nothing parrot, ripe for propagandistic ventriloquism. Luckily for the Obama Administration, just like Bush's, Good Germans like Seth Meyers continue to repeat government talking points without the slightest hint of skepticism or reason. Meyers is all too eager to defend Barack against his detractors, who are often portrayed as petty and vindictive Republicans, while willfully regurgitates the same old nationalism and xenophobia - which has not slackened at all with Obama's inauguration - with aplomb. "Christian and Muslim Britons joined forces yesterday to tell city officials to stop taking the Christianity out of Christmas, warning them that this simply fuels a backlash against Muslims. Also fueling a backlash against Muslims: terrorism." "Muslim groups are concerned that the new season of 24, which features Muslim terrorists setting off a nuclear explosive near Los Angeles will foster hate against them and create a climate of Islamophobia. Also creating a climate of Islamophobia: terrorism." It's clear that Meyers' own bigotry remains unabated and undeterred in this glorious post-racial American reconstruction era of Barack Obama. So, why should Iran as a nation, or Iranians as a people, apologize to the United States or the American people? According to Mr. Meyers, an apology is owed for the "hostage crisis" during which Iranian students held 52 U.S. diplomats in the American embassy in Tehran for 444 days. Perhaps this would be a reasonable request if history began on November 4, 1979, the day the embassy was taken. But it didn't. In 1953, the American government backed a CIA coup in Iran that overthrew the popular and democratically-elected Prime Minister Mohammad Mossadegh, after the nationalization of the Iranian oil industry, and installed a brutally repressive and violent dictatorship under Shah Mohammad Reza Pahlavi. The Shah ruled Iran, with constant US support and financial backing, for over 25 years, during which opposition to the tyrannical monarchy was countered and suppressed with imprisonment, torture, and execution by the Shah's security agency and intelligence apparatus, SAVAK. SAVAK was trained and funded by both the US and Israel. When the people of Iran finally rebelled and drove the Shah from the country in 1979, he found asylum in the United States. The United States has never issued any sort of apology for the 1953 coup, its support of dictatorship, or for its role in attempting to suppress the 1979 revolution. In order to strike a blow to US influence in Iran, which had been profoundly powerful during the Shah's reign, the American Embassy in Tehran was occupied by Iranian revolutionaries. The American government has imposed harsh economic and financial sanctions on Iran ever since. The United States has also covertly supported many anti-Iranian organizations since 1979. Most notable is its cooperation with and protection over the years of the Mujahedeen-e-Khalq (MEK), an Iranian opposition network that, in 1981, assassinated about 70 high ranking Iranian officials including cabinet members, elected parliamentarians, and the new Chief Justice when it bombed state headquarters. For eight years, between 1980 and 1988, the United States supported Saddam Hussein's expansionist war against Iran that cost over one million lives. During the war, Iraq used US-supplied chemical weapons on Iranian citizens. On July 3, 1988, an Iranian A-300 Airbus passenger plane was shot down by the U.S. Navy warship, the USS Vincennes, in Iranian territorial waters. All 290 people on board Iranian Flight 655 were killed, having been blown out of the sky by two missiles. 66 of the passengers were children under 12. Although the U.S. military called the attack an "accident," the crew of the USS Vincennes was awarded combat-action ribbons and its Commander was specifically commended with a medal for "heroic achievement." The U.S. Navy claimed that the crew of the USS Vincennes mistook the Iranian plane for an F-14 Tomcat fighter jet, an excuse that hardly holds up to the most cursory scrutiny (see diagram to the left for a tragic laugh). Iran's allegations that the warship was far too technologically advanced to make such a catastrophic mistake was dismissed by the American government. When questioned about the incident, then-Vice President George H.W. Bush growled, "I will never apologize for the United States of America, ever. I don't care what the facts are!" The United States military and government has never taken responsibility for this act of aggression and has never made an official apology to the Iranian people or government for the deadly assault on its citizens. Seth Meyers probably doesn't know any of this, which is strange considering this information is very easy to come by, to fact check, and to confirm. One might reasonably assume that, being the head writer of one of the longest-running shows on television, Seth Meyers is literate. All he'd need to do is read. Meyers also suggested that Iran apologize to the United States for "pursuing nuclear weapons." Despite the fact that there has never been any evidence of Iran's supposed quest for such weaponry (and extensive intelligence reporting to the contrary) and the Iranian government at all levels has constantly, consistently, and categorically denied any interest in militarizing their nuclear program on moral, rational, and religious grounds, and Iran's nuclear energy program is wholly transparent, heavily monitored, and completely legal under the Nuclear Non-Proliferation Treaty, Meyers has decided to take Cheney's word for it. Hey, it worked with Iraq, right? Meyers also blamed Iran for high gas prices. Odd, considering that nothing has affected these prices more than American imperialism in the Middle East, notably its current occupation of Iran's two neighbors. Also, Iran's oil output is drastically below full production levels due to the years of heavy sanctions imposed upon the country by the United States. In addition, few things would improve Iran's drilling and export capabilities more than a successful, functional nuclear energy program, which would provide much needed power domestically and free up oil and gas for shipment abroad. "If the Europeans are telling the truth in their claim that they have killed six million Jews in the Holocaust during the World War II - which seems they are right in their claim because they insist on it and arrest and imprison those who oppose it, why the Palestinian nation should pay for the crime. Why have they come to the very heart of the Islamic world and are committing crimes against the dear Palestine using their bombs, rockets, missiles and sanctions...If you have committed the crimes so give a piece of your land somewhere in Europe or America and Canada or Alaska to them to set up their own state there." "Some Western governments, in particular the US, approve of the sacrilege on the Prophet Mohammad (PBUH), while denial of the Myth of the Holocaust, based on which the Zionists have been exerting pressure upon other countries for the past 60 years and kill the innocent Palestinians, is considered as a crime." "What Ahmadinejad does is not denying the Holocaust. No! It is dealing out criticism against the mendacity of the imperialistic powers who use the Holocaust to muzzle critical voices and to achieve advantages concerning the legitimization of a planned war. This is criticism against the exploitation of the Holocaust...The assertion that Ahmadinejad denies the Holocaust thus is wrong in more than one aspect. He does not deny the Holocaust, but speaks of denial itself. And he does not speak of denial of the Holocaust, but of denial of the Myth of Holocaust. This is something totally different. All in all he speaks of the exploitation of the Holocaust. The Myth of Holocaust, like it is made a subject of discussion by Ahmadinejad, is a myth that has been built up in conjunction with the Holocaust to - as he says - put pressure onto somebody. We might follow this train of thoughts or we might not. But we cannot equalize his thoughts with denial of the Holocaust." Meyers mentions Iran's support for Hamas, the democratically elected representative of the Palestinian people in Gaza, as another thing Iran should apologize for. He does this less than two months after the Israeli military bombarded the Gaza Strip for three weeks, killing over 1,300 people, more than 400 of them children. Two new episodes of Saturday Night Live were aired during the massacre and, unsurprisingly, neither made any mention whatsoever of Israeli aggression. But here, quite unprovoked, Meyers decides to trot out an absurd litany of complaints against Iran. Clearly, for Meyers, resistance to dehumanization, starvation, invasion, occupation, and ethnic cleansing and the support for that resistance is, quite simply, "terrorism." I mean, hey, most Palestinians are Muslims after all and we know how Seth feels about those people. Finally, a reference is made to the outrage expressed over the publication of cartoons disparaging Islam in a Danish newspaper back in 2006. There were many protests, sometimes quite violent, all over the world in response to the offensive cartoons. In Iran, hundreds of protesters rioted outside the Danish Embassy in Tehran. Danish flags were burned, and the Embassy gate and two trees caught fire as well. The crowd was forced back by Iranian police with the use of tear gas. So, when Meyers mentions this event, does he mean that the Iranian people owe the Danish people an apology, or does he mean that the Iranian government should apologize for using tear gas on its own citizens in its attempt to disrupt a protest? Either way, how does a situation sparked by cartoons published in a Danish newspaper and the backlash Denmark received from it have to do with Iran apologizing to the United States? Is Copenhagen now an extension of Hollywood in Meyers' opinion? Perhaps it wasn't funny enough for Meyers to say that Iran might first want to consider asking for an apology from the United States for deeming it part of an "Axis of Evil" after spontaneous candlelight vigils were held in Iran for the victims of the World Trade Center attacks. The Iranian government was instrumental in allowing the United States to invade Afghanistan in 2001 and yet the US government consistently rebuffed Iranian overtures made by both Presidents Khatami and Ahmadinejad to reopen full diplomatic relations between the two countries. Perhaps Meyers should have suggested that the United States apologize for violating Iranian airspace with predator drones and territorial waters in the Persian Gulf with battleships since 2003 or for raiding the Iranian Consulate General in Iraq and arresting five staff members, before any demands are made on Iran. Meyers is a comedian and a writer, not a journalist. He is not expected to investigate and expose new truths to the American public at 12:05am on Sunday mornings; however, one might argue, it also isn't his job to propagate lies and strengthen the already ridiculous misconceptions of his audience. In short, while he's not Bill Moyers, he's also not Larry the Cable Guy - at least he should try not to be. The reason the American public doesn't know anything about the world around it is because of people like Seth Meyers. Propaganda isn't spread simply through White House press releases, shoddy Beltway reporting, and loud-mouthed punditry. Common beliefs need constant support and encouragement from the mainstream, from outlets other than political media, in order to become solidified within the mindset of a community. Entertainers, more than most, shape public opinion and help stereotypes linger in the collective consciousness of their audience. Nazi propaganda minister Joseph Goebbels said, "If you tell a lie big enough and keep repeating it, people will eventually come to believe it." Over six decades later, George W. Bush echoed this sentiment by explaining that, "In my line of work, you have to keep repeating things over and over and over again for the truth to sink in...to, kind of, catapult the propaganda." By making and repeating jokes based on false premises, comedians like Meyers do the busy work of war criminals like Goebbels and Bush, thus making their job easier. He is now firmly in service of the Obama Administration and will continue to push the same aggressive agenda under the guise of entertainment. we're anxiously awaiting your next post out here in LA.